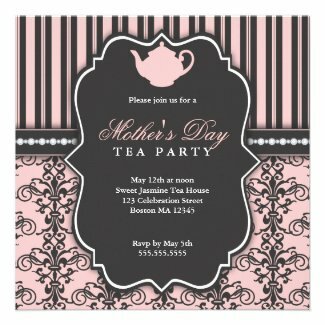 A Mother’s Day tea party is an ideal way to celebrate this special day with your mother, sisters, aunts and whole family. Tea parties are easy to do. They do require just a bit of planning. You can have a formal tea party or go for a fun and funky one. Even anything in between works, too. The planning is simple, really. First determine when your party will be during the day. A morning time, mid-afternoon, late afternoon, even evening can work for a tea party. When during the day you have the party will help you decide on the food options. It will also help you determine what kinds and how much food you want to serve with your tea selections. If you decide to chose a time that is very close to a meal, you might want to have the party in place of the meal. That would mean you have more substantial food options. If you chose a time that is in between meals, you may want less food or even go with just sweet options. No matter what you are serving, your food will need to be prepared as finger foods. Find out more about how to prepare foods at Foods for Tea Time. It’s an article that explains how to plan out and prepare the foods you choose to serve. Themes are always a fun and easy way to put together a party and a tea party is no different. You can go with a formal option where you and your guests dress up, you serve from your good china and you have fancy foods to serve. You can pick a silly theme, then decorate your table around that theme. Pick foods that will compliment that kind of theme. Even have tea choices that go with your theme. Your theme doesn’t need to be silly, it can be more sophisticated. Think vintage travel, spring flowers, even the era your own mother grew up in. How about using your mother’s hobby as a theme? When you plan out your Mother’s Day tea party, don’t forget the perfect teapot and teacups to use. At Whimsical Teapots and Teacups, you can find plenty of choices. Fun whimsical ones as well as romantic and floral. Don’t forget to check out how to brew the perfect pot of tea as well. You want your tea party to be a huge success so make sure you prepare ahead of time. And remember to enjoy yourself, too! I think having a Mother’s Day tea party is a wonderful idea! I agree! It’s a wonderful idea for Mother’s Day (or anytime you want to have some fun.) I would attend a tea party for any occasion or no occasion at all!